One concern that I hear often from yoga practitioners is: I keep working on my balance, but it doesn’t seem to be improving. If that’s the case, we need to take a closer look at what you are doing both in your yoga practice and your daily life to see if you need a bit of course correction. 1. Do at least a couple of balancing poses every time you practice. This is pretty obvious – if we want to improve our balance we need to practice balancing. This particularly applies to Gentle yoga-type practices – sometimes the teachers are so concerned about their older or less-capable students’ abilities that they spend a majority of the yoga practice close to the ground. But those are the same populations that benefit the most from balance training, so we need to make sure to include some simple balancing poses for them every time. 2. Make sure to hold balance poses longer. Aim for at least 6 full deep breaths in each pose and try to work it up to 10. This will give your body and brain a better chance of learning. 3. Pick easier poses, so that you could actually focus on the balancing aspect of the pose instead of a bazzilion of other things that are required in more difficult ones. Tadasana is an excellent example. There are so many things you can do with the balancing versions of this one pose – we will explore some of those options next week. 4. Simplify more difficult poses to make them more manageable. There is no need to attempt the most difficult version of the pose if it makes you fall out of it every time. Start with a modified adaptation and over time continue to move toward more challenging version (if appropriate). 5. Choose proper adaptations. I often see students leaning against the wall or other objects in their effort to tackle a yoga pose. The problem is that in leaning you are changing the weight distribution throughout your body which doesn’t help your body learn how to balance properly. Instead try keeping your fingertips on the wall. Start with all of them, then see if you can do it with two fingers of each hand, then one finger, then none, while maintaining proper body alignment. 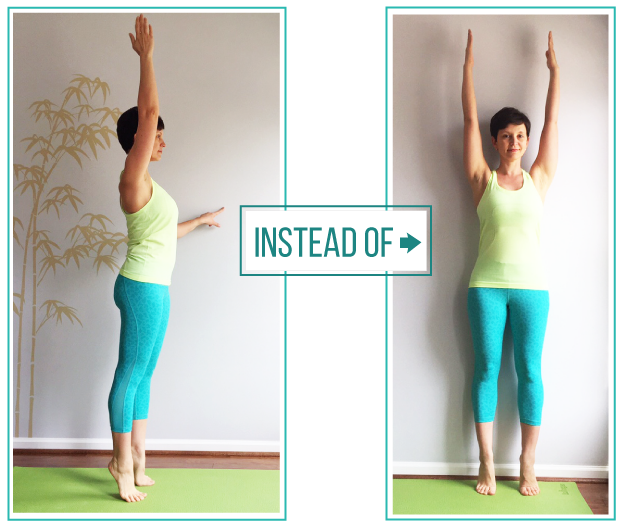 Quick note – it’s perfectly fine to use the wall in your yoga practice to support yourself in more challenging poses. But we usually do that to work on OTHER aspects of the pose, not the balancing aspect. For example, doing Half moon pose with your back against the wall is perfectly acceptable if you are working on the hip and leg strength, axial extension of the spine, etc., but it will NOT help you improve your balance. But if you do Half moon pose barely touching your toes to the wall, then you will add the balance training element, as well. So be mindful of how your pose modifications affect your balance training. 6. Train your dynamic balance, not just static. As we discussed a couple of weeks ago, dynamic balance training is necessary to prepare our bodies and brains for the challenges of everyday living. So make sure that you include dynamic elements in your balance training, such as moving in and out of the balance pose, moving within the balance pose and moving between two or more balance poses. 7. Focus. Do your best to drop the inner talk that often comes up when we do balance poses. A lot of emotions can come bubbling up to the surface ranging from fear to frustration to disappointment. There are different strategies that we can employ here (we will be talking about those in a few weeks), but the simplest one is to focus on counting the length of your breath. Once you get into the pose focus on inhaling for 6 seconds and exhaling for 6 seconds; next time inhale for 7 seconds and exhale for 7 seconds and so on. This gives our inner voice something to do rather then pointing out our balancing inadequacies. These are some of the ideas that you can implement in your yoga practice to see whether or not they will have a positive impact on your balance. Next week we will take a look at one of the most basic poses, Tadasana, and the wonders it can do for your balance training. Tune in! Awesome information, as I am constantly asked by students how to improve their balance, or do not understand why they have trouble with balancing poses. I will definitely share this information with my students. This is the most awesome yoga site I have ever seen. Love how you show and share your understanding. It’s substantive, but not overwhelming. Just right. Great information, both for my own balancing practice and for teaching my yoga students. The way you break down information in manageable and detailed pieces is brilliant. Thank you so much for sharing your knowledge! Your post on “Why is my Balance not Improving?’ from 11 May 2016 is the most complete and helpful I’ve found on the subject. Thank you Olga for breaking down the concept balance and making it achievable!